This soup is really hearty and filling – perfect for a chilly day! 1. Heat the olive oil in a large pan over a medium heat. Add the onion and cook gently for about five minutes until the onion has softened. 2. Add the garlic and the rest of the vegetables to the pan along with the spices. Continue to cook, stirring frequently, for another five minutes. 3. Rinse the red lentils and add to the pan along with the coconut milk and stock. 4. Bring up to the boil then turn down to a simmer and leave to cook, stirring every now and again, for 20-30 minutes until all of the vegetables and the lentils are soft. 5. Remove from the heat. Strip the leaves from the thyme and roughly chop the coriander, add to the pan and season to taste. 6. 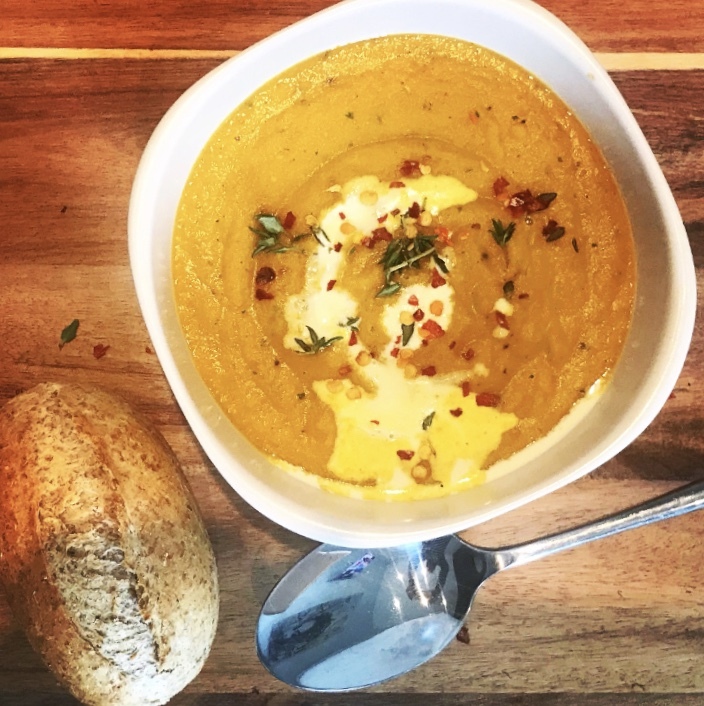 Use a stick blender to blend the soup until it is completely smooth then serve with your favourite bread, enjoy!